Red foxes (Vulpes vulpes) are mostly nocturnal mammals from the family Canidae. They have an immense geographic reach, existing in diverse locales including northern Africa, Scandinavia, the Far East and North America. As far as vocalization goes, red foxes are known for their shrill screaming sounds, which generally are heard in the nighttime. Red foxes have dog-like appearances, and are diminutive and lithe in form. Fully mature specimens usually weigh between 8 and 12 pounds, with body lengths of between 48 and 57 inches. Though they typically are out and about at night, daytime sightings of red foxes aren't too unusual, either. Their broad diets are omnivorous and are made up of components including songbirds, bugs, shrews, rabbits, fish, squirrels, mice, snakes, amphibians, worms, carrion, seeds, fruits and fish. When it comes to food, they're not choosy in the slightest. They sometimes even rummage through human trash for food. Red foxes hunt independently, rather than in groups. The scream of a red fox is a memorable one, with its high-pitched tone that is not too dissimilar from a wail of a human female. Their screaming also often is husky and monosyllabic in nature. When they scream, they often do so in sets, stopping and then starting up again in 3- to 10-second intervals. If a red fox screams, it could be a sign that he's either frightened or shocked by someone or something -- perhaps a predator. Some common predators of these foxes include both wolves and coyotes. 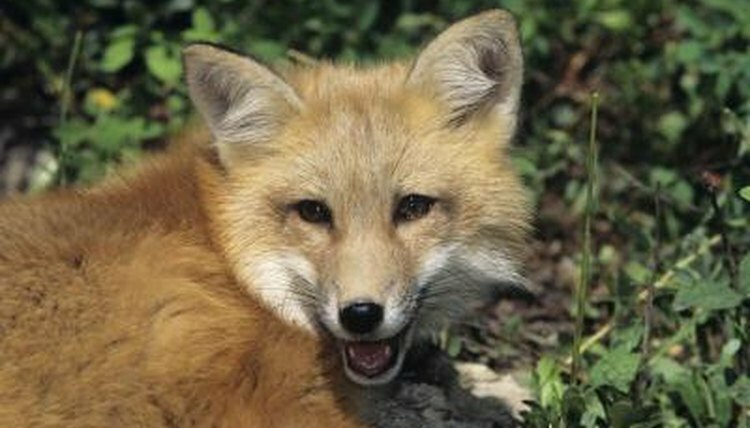 People also frequently prey on red foxes, either for their coats or because some individuals consider them to be nuisances. On the whole, however, mature specimens do not have a lot of predators. Red foxes also often scream at times of mating. Both genders are capable of producing the vocalization. Not only do they often scream while in the process of mating, they also often do so as a means of asserting their individual turf in the face of competitors. Screaming isn't the only way that red foxes vocalize. They also do a lot of barking, in true canine fashion. Barking is also a big part of reproduction in the red fox world. When the females of the species scream out for the males' attentions, the males in her vicinity generally bark back. This typically results in a battle between the males for mating access to her.